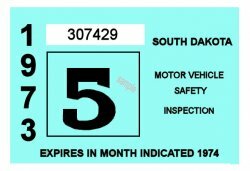 1973-74 South Dakota INSPECTION Sticker - $20.00 : Bob Hoyts Classic Inspection Stickers, Add a Final Touch to your Restoration! South Dakota began inspections in 1968 but this sticker is the oldest we have. If you have one not shown on this site, we will give you a reasonable price for it. If you send us a good photo, front and back, we'll reproduce one of your choice, free. This 1973-74 South Dakota inspection sticker was carefully restored and reproduced to completely remain faithful in color and size, front and back, to the original. It has a new modern "Peel and Stick" adhesive to plave it on your inside windshield like the original. It has been UV treated to prevent fading. Also for an additional $10.00 we can add an antique license plate number to the front of this sticker where the serial number now appears. Thanks to Steve Hoyt, Rochester IN and JoAnn Evans, Indianapolis for contributing this sticker.